The last task concerning window curtains was to make them fit to the curved wall. Easy fix and a big improvement by adding a lint and velcro. Now its held perfectly in place if you take some effort to close them properly, including pleading. 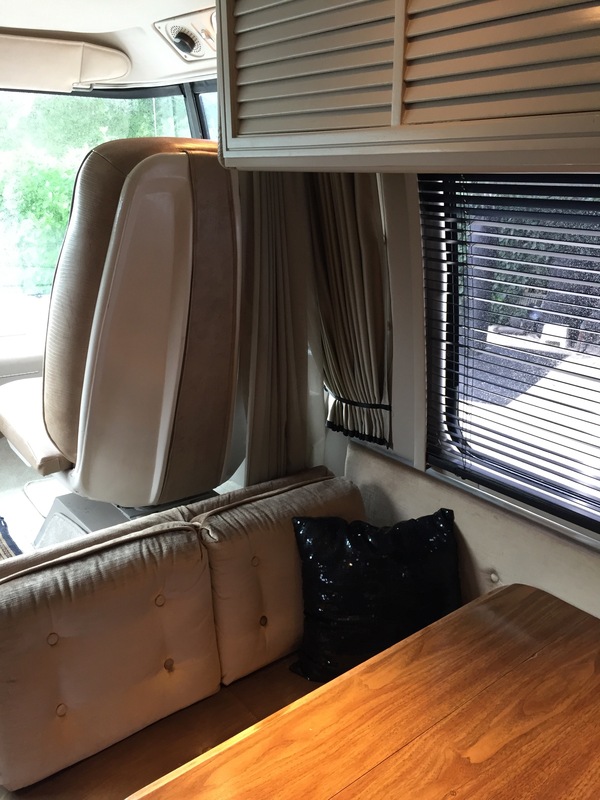 Off course no one (accept me) in our Motorhome is that organized…. After staring with the OEM curtain rail, we did change it out for a plastic bendable track (10 euro) The original track stopped before the curve and left a wide open space of 15cm on the sides. No double fabric to keep it thin when curtains are closed. The original curtains were from a very stiff cotton fabric and therefore did not hang very nice. What I liked about them was the single pleads with a back fold which is a spacesaver when opened. Material used is only 1,25 times the total length, sewed in pvc runners or fold hooks and runners) will do fine also. Velcro tape to keep the curtains on the curved sides. Important for me is that the curtains look nice, organized and sleek both opened and closed. The darkening fabric was a leftover piece I bought for 5 euro plus fold hooks and rail runners for 12 euro. This is just enough to remake the original curtains, however 1,5 the total length would have been nicer. For those GMC-ers who like to know how I made them I will try to explain here but I can tell you that I had to count and count over and over again and did not understand it at all until I actual did it. Here are some of the better examples of GMC-ers I found online. The 13 cm overlap when closed seems to be an issue when opened. I want to use fold hooks so you can hang them when opened. Same curtains closed. I will go a thicker darkening material. BEFORE: Curtain space small when opened.